Please refer to our stock # T 1800 when inquiring. 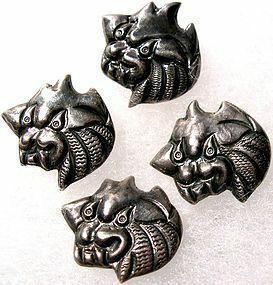 Antique silver button collectors look at this set of four antique Far Eastern Chinese export foo dog lion or dragon motif repousse chased unmarked silver buttons. Although unmarked, they test at least 90% silver, yet may be sterling. 20mm across and look at that ferocity! 3mm holloware thickness. The silversmith cut the front and backs, hammered and chased the front figural details, then attached the front and backs together. Nice old rich unpolished darkening, normal for their age. $9 USPS Priority/Ins/Track or Free w/ USA Ck or USPS MO.